Joe Meyer joined the Murray County Central Public Schools in 2011 and was appointed as Superintendent in 2016. Prior to assuming his current role, he served as the principal of Central High School for five years. He will begin his 26th year in the education profession in the fall of 2018. He has 13 years of experience as a school administrator. A native of Clear Lake South Dakota, Meyer holds a Bachelor’s degree with a major in Elementary Education and minors in Coaching and Physical Education from Northern State University in Aberdeen, SD, a Master’s degree in Education Administration from the University of South Dakota in Vermillion, and an Education Specialist’s degree with a Superintendent Endorsement from the University of Sioux Falls. 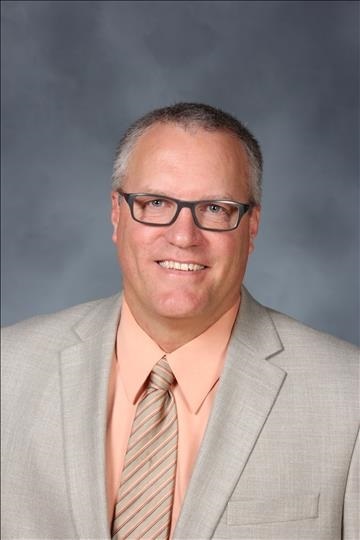 Before returning to school to earn his Master’s Degree in education administration, Meyer worked as an upper elementary school teacher for twelve years in the Parker Public School District in Parker, SD. He also was Parker’s Head Wrestling coach for a total of 15 years and served as the districts head football coach for three years after completing a five year stint as an assistant. After earning his administrators license, Meyer was hired by the Parker School District as their 7-12 principal. He served in this role for a total of 6 years before joining the Murray County Central School District. Meyer also has nine years of experience as an Athletic/Activities Administrator. Meyer was named South Dakota Southeast Area High School Principal of the Year in 2010-2011, was a finalist for South Dakota Principal of the Year in 2011, SE Area “Conqueror of Adversity” Award winner in 2008, and SE Area “Champion Team Builder” Award winner in 2006. In the coaching realm, Meyer was awarded the South Dakota High School Wrestling Coach of the Year in 2006 and the Region IIIB Wrestling Coach of the Year in 2002. He has also served on many education and coaching advisory committees and boards. In his spare time, Meyer enjoys golfing, traveling and spending time with his family. His wife Heather is a 1st grade teacher at MCC. They have four children, Tate, Eliese, Teague, and Emersyn.